An extensive network of nerves courses throughout virtually every tissue in our bodies. Yet, if you look up information on nerve injuries in medical resources you will find most of the attention on the pathologies associated with the large nerves, such as the sciatic, median, or ulnar nerves. However, there are many small nerves that are also root causes of pain or injury complaints. These nerves are often ignored because they are smaller and/or simply not studied in depth. Yet, many lie just under the skin and are affected, either positively or negatively with massage. In this issue we take a look at a number of these important smaller nerves. You might have heard of some of them, but chances are others will be unfamiliar to you. We’ll explore their location, pathway, and contribution to various pain complaints. Low back pain is one of the most common complaints. For this reason, nerve pain in and around the spine, particularly the low back, has been explored in great depth. 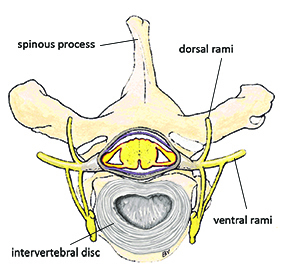 In 1934, a groundbreaking research paper published by Mixter and Barr highlighted the presence of the herniated intervertebral disc and suggested it was a key reason for low back pain and lower leg complaints.1 When a disc protrudes it is likely to press on the ventral branch of the exiting nerve trunk (Image 1). The ventral branches in the lumbar region, where most disc herniations occur, feed into the femoral nerve in the upper lumbar region and sciatic nerve in the lower lumbar region. This condition is called intervertebral disc pathology; for decades this complaint took center stage as the focus and cause of back pain for many physicians. As a result there were extensive developments in surgical strategies for attempting to rectify this boogey man of back pain. It wasn’t until many decades later and the development of more accurate high-tech diagnostic procedures that attitudes and understanding changed and began to move away from the focus on nerve roots and disc herniation as the underlying cause in so many cases. The high percentage of unsuccessful surgeries combined with the recognition that people with no back pain often had similar disc herniations indicated that just having a disc herniation was not necessarily painful, and may not be the root cause of pain. Interestingly, some of the newest research on nerve pain suggests that in fact it may be the small nerve fibers, such as the dorsal rami, that are a key to low back pain. Low back pain, while also potentially radiating down the lower extremity is often felt in the muscles and other tissues closest to the spine, which ironically are not innervated by fibers from the ventral nerve branches. Because they are very short, the dorsal rami don’t travel through any major tunnels or have nearby anatomical obstructions that often impact other nerves. However, that doesn’t mean they can’t be bound, restricted, or pulled. Many people report pain in their paraspinal muscles that is aggravated with additional pressure or stretching. It is likely that sensory fibers of the dorsal rami may be aggravated in many of these complaints. Massage therapists help people with paraspinal muscle pain by using long gliding strokes along the length of the muscles. This treatment helps reduce muscle tightness and increases blood flow to superficial capillaries and tissues that experience ischemia. Gentle approaches, such as those used in myofascial release techniques, apply traction to the skin, which decreases tensile forces on the dorsal rami nerve fibers. Taking tension off the fibers helps reduce the noxious signals sent back to the central nervous system and can greatly reduce back pain. Next time you are working on a client’s paraspinal muscles, try visualizing the location of the dorsal rami and consider how your massage techniques may be used to the greatest advantage in helping them function more effectively. Piriformis syndrome is most commonly suspected when a person has serious gluteal pain. Yet, there is another set of superficial sensory nerves that innervate the gluteal region and should also be considered for gluteal pain – the inferior, medial, and superior cluneal nerves. 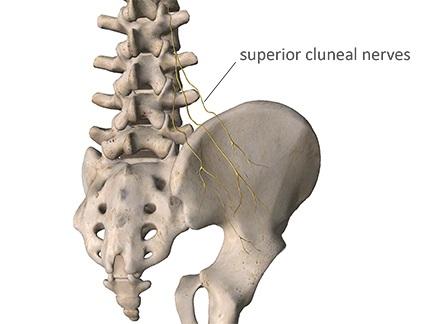 The cluneal nerves innervate superficial tissues in the entire gluteal region, yet they are rarely mentioned in references on pelvic or low back pain. It is likely that you haven’t even heard of them. The cluneal nerves are sensory, not motor, and are divided into three branches: inferior, medial, and superior (image 2). The inferior division branches off the posterior femoral cutaneous nerve (PFCN). As a result, it could be affected by piriformis compression of the PFCN, which was discussed in the last issue. The medial cluneal nerve is derived from the dorsal branches of S1-S3. It supplies innervation to the skin over the middle buttock region. Other S1-S3 nerve roots supply innervation to the lower leg. Sometimes a barrage of sensory input in one region can spill over to adjacent nerve fibers that are derived from the same level. 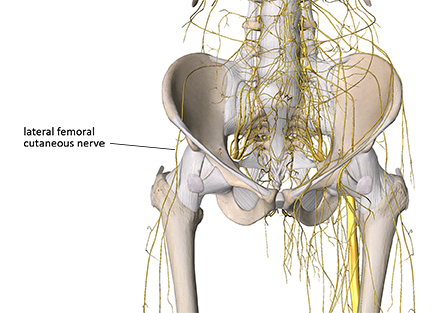 As a result, lower leg pain that is being reported to the S1-S3 nerve roots can extend into the buttock region because of spill over to the medial cluneal nerves. Similarly, pain that might be caused by entrapment of the medial cluneal nerves is likely to be felt in the buttock, but could also be felt in the lower leg. The medial cluneal nerve fibers pass just adjacent to the long sacroiliac ligament and this is one location where they are vulnerable to compression (Image 3). Irritation or entrapment of the medial cluneal nerve by the long posterior sacroiliac ligament is often mistaken for sacroiliac joint dysfunction.3 Identifying specific tissue causes of sacroiliac joint pain can be very difficult and one reason may be involvement of nerve pain in small nerves like the medial cluneal nerve that are not easily identified. The superior cluneal nerve is the division most susceptible to compression injury and is a likely cause of back or gluteal pain. Noting the anatomical path of the superior cluneal nerve it is easy to see how it could be involved in these conditions. (Image 4). 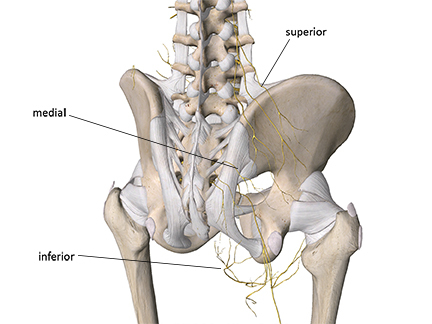 It arises from the posterior rami of the 1st through 3rd lumbar vertebrae. It angles diagonally from the lumbar spine and then its branches pierce the thoracolumbar fascia and course across the upper margin of the iliac crest. Entrapment of the superior cluneal nerve fibers can occur as they pierce the thick thoracolumbar fascia, or they could also be compressed against the bony edge of the superior iliac crest. The thoracolumbar fascia is a dense fibrous tissue, so it can be difficult to increase elasticity or pliability of the fascia where the nerves pierce through it. 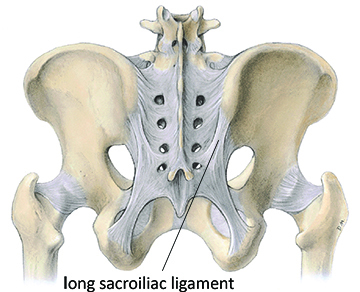 The region just under the lip of the iliac crest is a common location for the aggregation of small fatty lipomas. They feel like small peas under the skin when you are massaging this area. They don’t appear to involve significant tissue pathology, but they can sometimes be painful. One possible explanation for their pain could be pressure on adjacent superior cluneal nerve fibers. devoted an entire issue to treatment of the gluteal region. Many of the techniques described in that issue could be helpful in freeing up mobility and reducing compression on cluneal nerves. A frequently overlooked cause of lateral hip and lateral thigh pain is entrapment of the lateral femoral cutaneous nerve (LFCN). This condition also goes by the name of meralgia paresthetica. The LFCN supplies sensation to the skin on the lateral thigh and hip region. The nerve originates from the L2 and L3 lumbar nerve roots and then courses around the inner aspect of the iliac crest. It then descends beneath the inguinal ligament. It takes a very sharp bend just as it passes the inguinal ligament, which is one of the locations where it is frequently entrapped (Image 6). Just after the nerve passes under the inguinal ligament, it passes through the fascia lata of the thigh. The fascia lata is a connective tissue sleeve encompassing all the thigh muscles. When nerves pass through muscles or connective tissues, as they often do, they are highly susceptible to compression. There are a few different anatomical variations in the pathway of the LFCN. In some cases the nerve may pierce through the inguinal ligament or the sartorius muscle as it is leaving the pelvis and entering the anterior/lateral thigh region. It is common for nerve compression to occur in this region from clothing such as tight jeans, especially if the individual is sitting for long periods. Nerve compression can also occur from girdles, belts, military armor, seatbelts, or in diabetic or obese people. Symptoms from LFCN compression can include pain, coldness, numbness, paresthesia, burning sensations, and/or disturbances in sensation or itching or buzzing sensations in the skin of the lateral hip or thigh. Some people find pain sensations from LFCN compression so strong that they won’t put things in their pocket on that side because of additional pressure on the nerve. LFCN pathology is often mistaken for other conditions such as lumbar nerve root pathology, trochanteric bursitis, hip joint pain, joint capsule problems, abductor muscle pain, myofascial trigger points, or iliotibial band pain. It is common for manual therapy practitioners to engage direct treatment of these tissues in an effort to address the pain problem. However, in many cases this treatment approach might cause further aggravation of the problem if they do not recognize that the disorder is coming from nerve compression. Manual compression of nerves from soft-tissue work can further aggravate the condition. The LFCN is a very small nerve and often the region of compression is simply a small area where the nerve perforates through another tissue, where it becomes constricted. One of the more effective ways to address this type of disorder is simply applying traction to the skin and pulling the skin over the upper anterior thigh in an inferior direction (Image 7). This treatment actually helps to mobilize the nerve tissue and decrease the degree of binding between the nerve and adjacent tissues that are interfering with it. The first step in resolving many clinical problems is accurately determining what the problem is to begin with. Medical references don’t cover many of these superficial nerves in much detail so it is no surprise that there is often little attention paid to nerve dysfunction from them. Now that you know a bit more about their existence and roles, and how they may contribute to your client’s complaints, you can consider them as a potential factor in your assessments. Mixter, W J, and J S Barr. 1934. “Ruture of the Intervertebral Disc with Involvementof the Spinal Canal.” N Engl J Med 211: 210–15. Tubbs, RS, E Rizk, MM Shoja, M Loukas, N Barbaro, and R Spinner. 2015. Nerves and Nerve Injuries: Vol 1: History, Embryology, Anatomy, Imaging, and Diagnostics. Amsterdam: Elsevier. Aota, Yoichi. 2016. “Entrapment of Middle Cluneal Nerves as an Unknown Cause of Low Back Pain.” World Journal of Orthopedics 7 (3): 167–70. doi:10.5312/wjo.v7.i3.167.